Tis the season – the season of parties galore. It seems I can hardly open a search engine without seeing posts everywhere on how overstressed everyone is, and how to stay on budget and not overeat during what is basically an extended season from Thanksgiving through New Years. Party food CAN be downright cheap, taste great and provide an alternative option on a table groaning with overly cheesy, gooey or fried calorie ridden dishes. While some of the below are “healthy,” a few are lower calorie alternatives and some are just in the “not so bad for you” as everything else category! All should fit your budget. See my menu of Appetizers & Munchies for more ideas and happy whatever Holidays you’re celebrating through the season! Load your holiday party tray up with a couple of homemade items like a wonderful spread or two, and fill it in with inexpensive crackers, common fruit like apples and grapes, cubes of grocery store cheese, some lunch meats and so on. Raid your fridge for things like pickles and olives. The idea is to make it look abundant and gorgeous and full of delicious, not pricey ingredients and no one will notice this tray was put together on a budget! Hummus is always cheap and healthy and bonus for easy! And of course, it’s delicious and everyone loves it – and most hummus will fit just about any body’s diet. It’s fun to serve three varieties of hummus, in matching bowls, each with their own distinct flavor and color or in serving bowls that have multiple sections. Here are my Smoky Cauliflower Hummus, the classic Hummus bi Tahini, and Roasted Red Pepper Hummus. Beloved by kids and adults, they’re so old-fashioned they’re retro. When they appear at any party table they go fast. They’re easy to dress up in any number of ways. Try cutting them so they stand up and adding a few chives at a jaunty angle – it makes fewer servings but also makes them seem a bit more special. While they may not be the healthiest food on the buffet table, they compare well to many of the alternatives and are a welcome protein amongst the many carbs on a buffet table. Here are my recipes for Deviled Eggs with Bacon & Smoked Paprika and Classic Deviled Eggs. And you might want to bone up on hard-boiled eggs, so take a peek at Classic Hard Boiled Eggs, Easy Peel Steamed Eggs or Perfect Instant Pot Hard Boiled Eggs. If you’re on the way to a buffet, consider making a big salad, using inexpensive Romaine as a base. Maybe this Seasonal Winter Salad, or maybe this Wild Rice Harvest Salad or this classic, Healthier Harvest Salad. You might be surprised how many people will welcome a little salad at a buffet, especially if they are as gorgeous as these are! 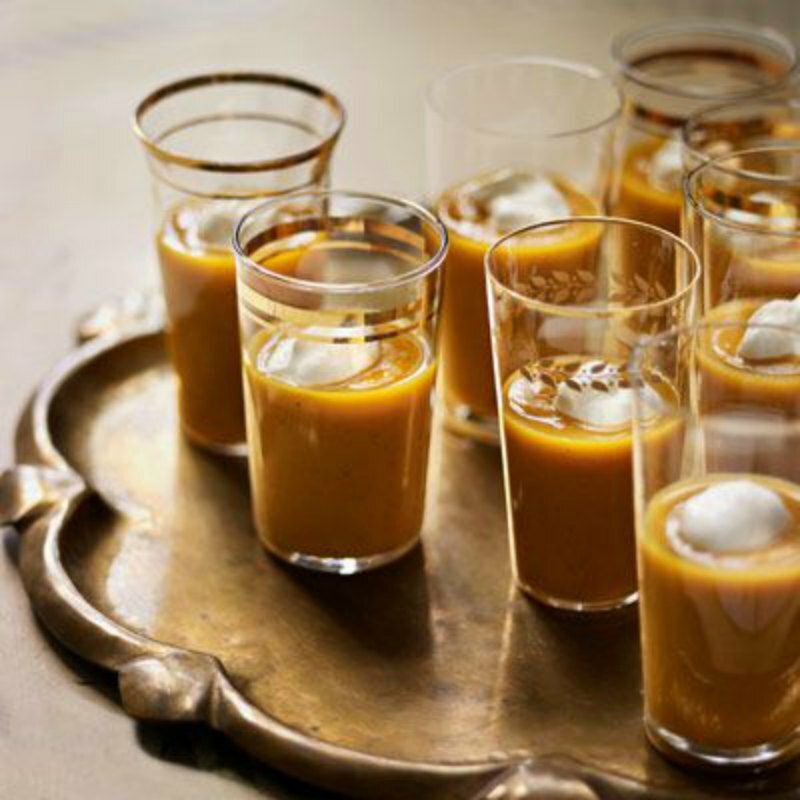 I love the idea of serving a soup like this, that can be served at room temperature in little shot glasses at a party. This recipe and photo are from Country Living makes a ton, and could easily be halved. Don’t stop there, though! There are other soups that would work just as well. A little goes a long way when served as shots at a cocktail party. Pick up an assortment of mixed glasses at a thrift store and you’ll still be way below budget. Use them to serve small deserts and puddings like Chocolate Pots de Creme, or add a dip and fill with stalks of veggies. Always popular, and always on sale around every holiday, mushrooms can be stuffed with a variety of things! Cheapest is probably a bread-based vegetable stuffing with a little Parmesan, like my Stuffed Mushrooms with Wine, but even fancier mushrooms are still not likely to break the budget. These more complicated Cider & Sausage Stuffed Mushrooms are outstanding and & love this uptake on the store deli mushrooms that you take and bake, Cheddar Bacon & Jalapeno Stuffed Mushrooms. Oven Roasted Chickpeas have become a new favorite. Roast them dry, flavor as you wish and you’ll have crunchy, crispy little balls of happiness. Given how popular Wasabi peas have been, I can’t imagine these would be anything but a “new” amazing dish for many people at the buffet. There are a ton of recipes for Chana (Chickpeas) that are roasted and soft, but these are crunchy! Oven Roasted Chickpeas – Just do a spritz with a little olive oil and toss with a spice mix. If you have time to do a little baking, the beauty of Gougeres is that you whip them up and pipe them out (you can use a Ziploc bag for this, just snip off a corner) and freeze them to take out and bake on a moment’s notice. They’re super inexpensive to make and absolutely addictive, and they’re a little classy, too. While these are white cheddar, use your fave cheese. Crostini, “little toasts” really require no cooking skills (but use a timer so you won’t get distracted” and are easy and cheap…who could ask for more…or less? Twelve Crositini ideas from Saveur, and 19 from Toast Toppers. Pictured below are Lima and Pea Crostini and Crostini with my Fresh Pea Pesto. They’re a wonderful substitute for the more expensive Fava. Top, if you’d like with herbs, olive oil, a few shavings of Parmesan or a dollop of Ricotta. A few crispy fried prosciutto shards never hurt anything! While Phyllo is a “gourmet” product, it is often on sale around the holidays, usually about 1/2 price and often unadvertised. Pick up a few packages to toss in the freezer. A package goes far if you cut it into squares and layer it in mini muffin tins and bake off little cups and it’s so much cheaper to make your own than to buy the premade cups. Wonton wrappers make great little cups, too. My stuffed Wonton Appetizers can be filled with Pulled Pork, BBQ Beef, Sloppy Joes or just about anything along those lines or you can go with something like a spinach dip for creamy deliciousness. It takes very little filling to make anything like this. You can never go wrong with beans on a budget – and beans can be fabulous – if they are made up in the form of this White Bean Dip! Toast off your own Pita Chips and you’ll pay a fraction of the cost of buying them in a box! If you buy the puffy Pita, split it into two layers and double the number of chips. I love this Red Lentil Dip with a Spanish Flair. It may not look like much but the flavor is outstanding! Memorable! Lick the bowl good. Lentils are always inexpensive, and I find the red ones (they’re really more orange) in my regular grocery store now, usually in the bulk aisles. I hope you found a little inspiration here for your holiday party or an item or two to tote along to a get-together! If not, check out my extensive Appetizer & Munchies menu for more fabulously frugal items! And remember, frugal doesn’t always have to be cheap, but it can always be fabulous. Shop well, watch the specials at the store and take advantage of holiday pricing and sales. This entry was posted in Click here for Fabulous Food Posts and tagged Appetizer, Frugal Hausfrau, Special Occasion. Bookmark the permalink.